First, i’d like to say Welcome to my blog, I am not anything or anyone, just someone who has a lot of free time and want to fill it with things that are useful and beneficial to others. 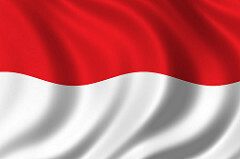 This blog contains information about various things about the art and cultures in Indonesia. The purpose of this blog is to be more loving and preserving the culture of Indonesia and also to introduce it to the rest of the world that Indonesia is very rich with a range of range of customs and also art and culture. And finally I say thank you for visiting my blog. Salam sukses dan damai selalu....!